Formerly known as the 'American Grand Prize', the USA Grand Prix takes place in the state of Texas. The race is hosted at the Circuit of the Americas based in Elroy, just 12 miles south of Austin. With a sweeping first sector followed by long straights and a twisty technical final sector, the track extends over 5.513km, allowing for some exhilarating F1 action. Encompassing everything that America has to offer, the United States Grand Prix offers the perfect opportunity for an exciting break to America's South. Embrace the opportunity with numerous must-see attractions Austin has to offer. With Red Eye's VIP hospitality at the root of the weekend, indulge yourself in Texan culture, whilst quenching the need for speed in total luxury. F1’s former president, Bernie Ecclestone vowed 'never to return' to the Indianapolis race following a diabolical event in 2006 leading to just 6 cars taking to the grid; suggesting no immediate plans to bring F1 back to the United States. However Austin, Texas was granted permission to host the event on a 10-year contract. The deal began in 2012 and the track architect Hermann Tilke, designed the circuit across 800 acres. It promised to be one of the most challenging and spectacular races of the F1 Championship. Proving to be just that, the track has selected corner sequences directly inspired by the best circuits in F1 racing, such as Eau Rouge, Maggots/Becketts and Turn 8 at Istanbul. Driving the perfect line straight off the mark was reigning champion Sebastian Vettel, as he took pole position in the first Texas GP. However, it was 2007's winner Lewis Hamilton sweeping in to take the cake, emerging victorious as the two finished nearly 40 seconds ahead of third place. Hamilton has secured a further 4 wins since his historic victory, totalling 6 impressive victories. As the most successful driver in the US, could this year be lucky number 7? As the state capital of Texas, Austin is renowned for its electric live-music scene, in addition to the numerous parks and lakes suited perfectly for outdoor activities, such as hiking, biking, swimming and boating. Sightseeing Tours in Austin - Featuring numerous touring agencies ready to venture across the arts and music scenes. Visit architectural landmarks; discover urban winemaking or feast on authentic Texan BBQ. Zach Theatre - Draw the curtains with breath-taking theatrical performances. Experience jaw dropping musicals; suited for children of all ages! Room Escape Games - Visit the numerous games and entertainment centres available. It's a childhood relived as fantasies come true. Plans are made to escape from completely immersive environments. Hunt for gold in a museum, escape from prison or steal back a piece of art! Lady Bird Lake Hike-and-Bike Trail - Go off the beaten path and explore a scenic trail through lush parks and beautiful lakes. Bike, hike and run through 10 miles of immersive scenery. LBJ Presidential Library - Bask in the glory of America’s presidential history. Indulge the various exhibits the museum has to offer, located at The University of Texas. Combine the USA GP with a long haul to Americas Deep South as you experience the vibrant, musical Texan culture. 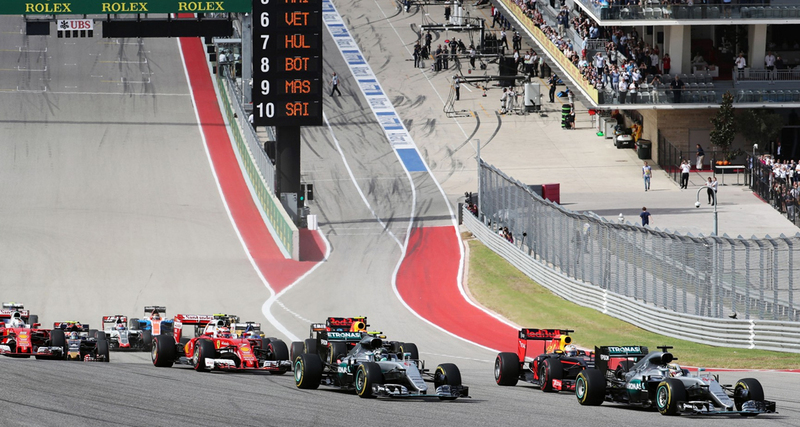 Live it up at one of the most exciting and challenging races of the F1 calendar whilst visiting Austin's must-see attractions. Our luxurious hospitality; 'Formula One Paddock Club Austin' sits you right above the start/finish line where you'll overlook the pit lane with an unrivalled view. The package provides all day refreshment with an open champagne bar. Additionally, you'll feast on gourmet cuisine, whilst savouring the finest wines. Be at the heart of the action with exclusive pit lane tours and driver appearances. Pack your bags and embark on a well-deserved break to Texas. Couple the F1 with Austin's multitude of attractions, exclusively with Red Eye Events. Enquire for a price on our package via our website. We look forward to seeing you there! Stay race ready, be the first car on the grid with more package announcements at Red Eye Events.